A reader recently contacted me and told me a little about a descendant of Samuel Clyde and Catherine Wasson Clyde about whom I've written extensively. I have not followed the genealogy of all of the couples children so I was surprised to find out about their amazing great-granddaughter; Caroline Clyde Holt. Here is what I know about Caroline. 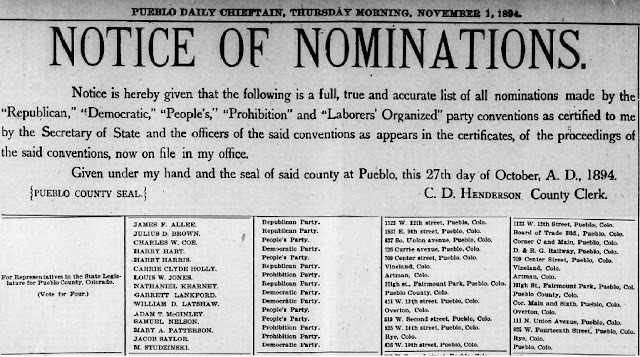 In 1881 Caroline, who went by "Carrie" married Charles Fredrick Holly, also an attorney. They were living in New York in 1885 when their daughter Emily Ethel was baptized in a church for the Deaf. The family moved to Colorado by 1889. Charles was significantly older than her. He was born in 1819 and was a Colorado Territorial Supreme Court Justice in 1865. He also served during the civil war. In 1893 Colorado voted to enfranchise women, women could not only vote but run for office. Caroline, who is said to have studied law under her husband, took was active in the Women's Suffrage Movement. She ran for public office, first as a member of the School Board and then in 1895, along with two other women, for the State Legislature. All three were elected. 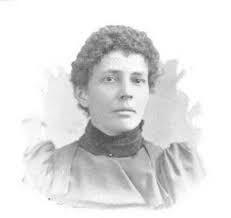 Caroline Clyde Holly is still honored in Colorado as a pioneer of Women's Rights. I think her grandmother Catherine Wasson Clyde would have been very proud of her achievements. "New York, New York City Births, 1846-1909," database, FamilySearch (https://familysearch.org/ark:/61903/1:1:2W71-9XR : 11 February 2018), Caroline C. Holt, 01 Jul 1856; citing Manhattan, New York, New York, United States, reference Birth Reg 1856-1857 New York Municipal Archives, New York; FHL microfilm 1,421,411.